In the event of a fire alarm (real or practice), or another emergency, the Fire Registers feature lets staff take registers accurately and as quickly as possible. As opposed to a normal register, Fire Registers present staff with one student at a time, along with their image (where available in the MIS). 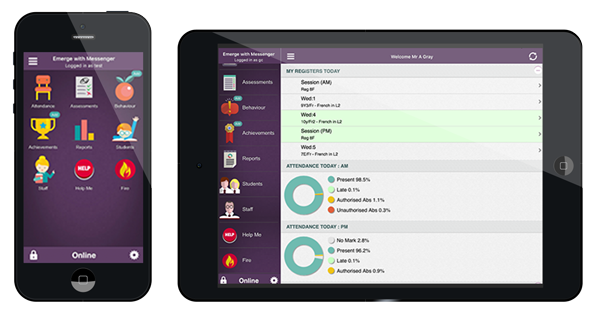 This feature uses live attendance data to alert staff if any students are missing. 1) Tap on Fire from your Dashboard (Homepage). 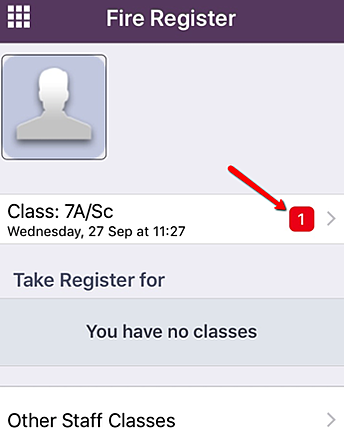 2) If you are linked to classes, tap on a class from the list shown under Take a Register for. 3) If you are not linked to classes, or you need to take a Fire Register for another teacher’s class, tap Other Staff Classes. a. Search for the teacher for whom you wish to take the Register for and tap on their name. b. Select a class from the list shown under that teacher’s name to open its Register. a. The student’s Name and Registration Group. b. If they should be present (marked as such earlier in the day), you will see an icon next to the Present mark for that student. Similarly, if the student should be absent, you will see an icon for them. c. Further down, the student’s Attendance for all other periods in so far in the day will be displayed. 2) To mark each student’s attendance for the Fire Register, tap either Present or Absent. Once you have selected a mark, the next student will be displayed and so on. 3) Once you have finished marking students in a class, you will be able to view a Summary of marks for the class. b. 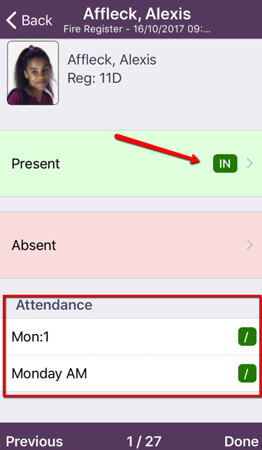 However, if you have marked any students as absent, but they should be present at school (as per earlier attendance marks) they will be separated for you to view. Tap Absent, expected Present to view important information regarding each missing child, including contact information and the last class they should have been in. c. Tap Finished once you are done with this register. 1) Any registers that you have previously taken will be displayed from the main Fire Register page. 2) If there are any missing students, the number will be clearly marked next to that register. 3) Clicking on the Fire Register for a class will take you back to the Summary page (see Take a Register, Step 3 above). This will give you quick access to the list of students that the school or emergency services need to treat as a priority. Fire Registers are not recorded back to your MIS. However, they will be saved to your device for as long as they are needed. Follow the below steps to remove Fire Registers you no longer require. 1) Tap Fire from your Dashboard (Homepage). 2) From the list of registers located on the Fire Register page, swipe left on the class that you wish to delete the fire register for. 3) Alternatively, logging out of the Emerge mobile app will automatically remove any Fire Registers that you have taken.